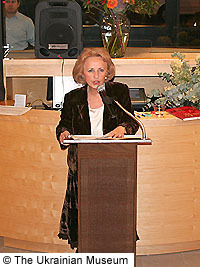 New York City, November 23, 2005  The Ukrainian Museum opens the second inaugural exhibition The Tree of Life, the Sun, the Goddess: Symbolic Motifs in Ukrainian Folk Art, in its new facility on November 23, 2005. The exhibition continues the celebration begun earlier this year when the Museum moved into its newly constructed building at 222 East 6th Street in New York City. 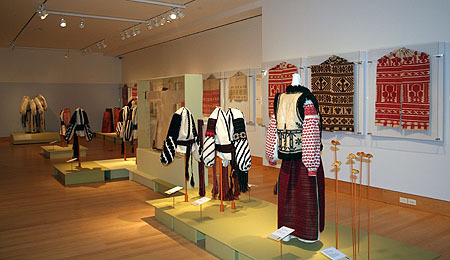 More than one hundred artifacts drawn from the Museum's extensive folk art collection are included in the exhibition, which will be on view through September 2006. The curator of the exhibition is Lubow Wolynetz, curator of the Museum's folk art collection. Ms. Wolynetz has curated more than a dozen folk art exhibitions at the Museum, written extensively on various aspects of Ukrainian folk art and traditions for the Museum's catalogues, and lectured widely on the subject. The Museum inaugurated its new facility in April of this year with an exhibition of works by Ukrainian-born sculptor Alexander Archipenko. The new Museum building, funded by donations from the Ukrainian American community nationwide, was designed by George Sawicki of SawickiTarella Architecture+Design, a New York-based architectural firm. The building includes spacious galleries, a state-of-the-art collections storage facility, a gallery/auditorium, a library, and a gift shop. The exhibition The Tree of Life, the Sun, the Goddess: Symbolic Motifs in Ukrainian Folk Art was designed by Natalie Fizer and Glenn Forley of Fizer Forley, a research and design office located in New York City. Their work, which explores both architectural and cultural artifacts, has resulted in numerous exhibitions across the country. In the exhibition at The Ukrainian Museum, the design team has placed "Tree of Life, sun, and goddess motifs found in artifacts used every day within the larger temporal cycle of the agrarian calendar and the birth-to-death life span." The Tree of Life, the sun, and the goddess are the three most prevalent motifs in Ukrainian folk art. They can be found on embroidered and woven textiles, ceramics, woodwork, metalwork, pysanky (Ukrainian Easter eggs), and holiday and ritual breads. Exhibition curator Lubow Wolynetz explains that while such designs today are considered ornaments, "in ancient times they had deep cosmic, religious, magical, and ritualistic significance. Each symbol represented something sacred and carried a message, transmitted information, revealed and communicated a mystery, or evoked and influenced man's actions." The purpose of the exhibition is not only to identify these motifs but to explain their meaning and to examine why, how, and where they were preserved through the ages; how their appearance was modified or changed; and their role in the contemporary Ukrainian experience. The exhibition includes descriptions of the rituals and traditions in which images of these motifs were prominent and interprets their significance in the ceremonies and customs in which they played an important role. Presented in the Museum's spacious first-floor galleries, the exhibition features folk costumes, men's and women's embroidered shirts, kilims, ritual cloths, woven sashes, earthenware painted pottery, carved wooden boxes and plates, and pysanky (Ukrainian Easter eggs). The artifacts on display are from various regions of Ukraine and date from the 19th to the early 20th century. A variety of holiday and ritual breads that incorporate the three motifs - such as the Easter paska and the korovai (wedding bread) - are also featured. Ms. Wolynetz was assisted in this project by two consultants, Dr. Natalie Kononenko of the University of Alberta at Edmonton and Dr. Ludmyla Bulhakova-Sytnyk of the Ukrainian State Museum of Ethnography and Crafts in L'viv. Each contributed an essay exploring one of the motifs to the exhibition catalogue. According to Ms. Wolynetz, the tree is a universal and ancient symbol in many cultures of the world. "The image of the Tree of Life in Ukraine has been in continuous use since the Neolithic period, the age of Trypillian culture (5400-2700 B.C. )," she explains. "The ancient symbolic motif of the Tree of Life can be found in almost all aspects of Ukrainian folk art, especially in objects that still have ritual significance during seasonal holidays - like the pysanka (Easter egg) - or in personal lives - the rushnyk (ritual cloth) and ritual breads, for example." Dr. Ludmyla Bulhakova-Sytnyk notes that the geometric ornamentation so often seen in Ukrainian folk art appeared with the beginning of culture. "A straight horizontal line represented the earth, a wavy line represented water, a cross represented fire, and a circle or square symbolized the heavenly fire - the sun." The importance of the sun in the lives of ancient peoples cannot be overstated, she adds. "Ancient Ukrainians not only associated the sun with life, but also calculated time in terms of daily and yearly cycles." Furthermore, "everything that was good was associated with dawn, and all that was bad . . . with sunset and night." Dr. Natalie Kononenko's essay on goddess figures in Ukrainian folk art stresses the importance of women as celebrants of ritual in Ukrainian culture. She notes that representations of female figures - goddesses - are predominant in archaeological excavations on the territory of present-day Ukraine and that many of the ancient deities "seem to perform functions analogous to the ritual functions that women perform today." As part of the exhibition, the Yara Arts Group, a resident company at the world-renowned La MaMa Experimental Theater, will present a "frozen performance" that echoes the theme of the exhibition. Conceived by Virlana Tkacz and Watoku Ueno, the performance offers a glimpse into the Koliada - a traditional winter ritual in a Carpathian village. The art performance debuts on December 11, 2005, and continues through January 29, 2006. Short performances, vocal workshops, and concerts of folk music will accompany this project. The bilingual (English and Ukrainian), illustrated catalogue that accompanies the exhibition was funded by the Self Reliance New York Federal Credit Union. The Tree of Life, the Sun, the Goddess: Symbolic Motifs in Ukrainian Folk Art is sponsored by a number of financial institutions, organizations, Museum members, and friends from the Ukrainian American community. Their generous support ensures the Museum's ability to fulfill it mission - to collect, preserve, and exhibit objects of artistic or historic significance to the rich cultural heritage of Americans of Ukrainian descent. In conjunction with the exhibition the Museum is offering guided tours as well as a variety of workshops and gallery activities for students, schoolchildren, and families. The educational components of the exhibition are supported in part by a grant from the Institute of Museum and Library Services.